Champaca was one of my early favorites from the Ormonde Jayne line. 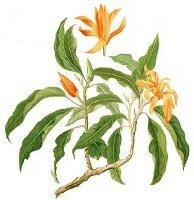 According to the Ormonde Jayne website, the champaca flower is related to the magnolia. The champaca tree is also called the "Joy perfume tree", as it is said to be one of the primary notes used in Jean Patou Joy. It is also found in Christian Dior J’Adore, and is one of the ingredients used to make Nag Champa incense. The notes for Ormonde Jayne's Champaca fragrance are neroli, pink pepper, bamboo, champaca, freesia, basmati, myrrh, green tea, and musk. Champaca starts with dry neroli and just a touch of pepper. After a few minutes, it smells almost eerily like basmati rice cooking on the stove, and in that sense, it is a foody fragrance, but it is far from the heavy, dessert-like fragrances that the term "gourmand" usually calls to mind. The basmati slowly fades to a whisper and is joined by light florals and a true green tea note — something else I find rather rare in perfumery. After it dries down, there is a touch of resin from the myrrh. It is creamy, and just slightly sweet. The bamboo adds a nice woody undertone without any heaviness. One of the things I adore about the Ormonde Jayne line, and Champaca is no exception, is that while the fragrances are composed of modern materials, the individual notes maintain an old-fashioned, pre-aldehydic kind of distinctness. These are perfumes for people who really like to smell things, and they don't appear to have been influenced by modern test marketing practices. Champaca has a great deal of character, yet is light enough to wear right through the summer. I do not find it pretty in the conventional sense, but it is an unusually compelling and comforting fragrance. When I wear it, I tend to walk around sniffing myself compulsively. And just in case any of you were wondering what to give me for Christmas, the picture just above shows the "Belle of the Ball" gift box, which includes 3 mini candles, the body lotion, bath oil, crème, and Eau de Parfum spray. It is available in all 7 of the women’s fragrances, and not to be greedy, but I will take one of each. Ormonde Jayne Champaca is available in 50 ml Parfum or Eau de Parfum; for buying information, see the listing for Ormonde Jayne under Perfume Houses. 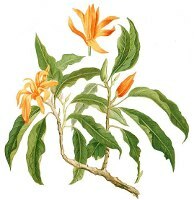 Note: top image is Michelia champaca [cropped and altered] from Flora de Filipinas by Francisco Manuel Blanco, via Wikimedia Commons. Hello R!! Guess what I am wearing today – yes rice and tea and some Champaca! ;D I find this rather unusually compelling as you describe and since my return from India I have been wearing this a lot. This comforts me too. I actually love the bath oil and lotion too. I love your review of this perfume. I guess I'll have to go along with who ever said earlier “I don't wear rice”. This is the only one from the line I just can't love. Basmati rice however interesting, is not something I want to smell like. I did pass my sample along to a male friend. I have a feeling he'll wear it well. I will agree though, it's nicely crafted. Morning N! I need to try the lotions…but it will have to wait for the dollar to recover. V, interesting, I did not think of it but it could easily work as a unisex. And I have my own line in the sand: I don't wear meat — (Dinner by Bobo). your noting that it is a modern fragrance with the best attributes of a “pre-aldehydic” was thought provoking … what a content-rich line AND post. thanks. LOL! I detest this one too. Hmmm — tea and rice. These are staples in my Asian diet. Gotta try Champaca! P.S. I'll put in a word for you with Santa! Linda was oh so sweet and told me about many of the scents. As she described the Champaca, your words came to life! Linda said that some of her scents – Tolu and Ta'if – are more suited to winter, while the Champaca and Ormonde are more spring/summer. Being the “patch hag” that I am, I asked if there was any patch in her scents, but alas, there is not. However, the musk, bamboo, and basmati will make up for it. I told Linda that I'm an MUA fragrance-addict, and that my current obsession was Clive Christian “X”, which she was surprisingly not familiar with. She did stress that one should apply her scents, then let them settle down for a full 5 minutes. I can't wait to receive the sampler – they are being posted today! It’s so fascinating that Linda describes Ormonde as being a winter scent. I would have thought it was more of an autumn/winter. I’ll definitely be cracking it out during the hotter months to see how it works in the heat. Quite frankly, it is such a gorgeous scent, I would wear it anytime, anywhere. Linda seems mucho coolio. I was in her store last weekend, introducing a mate of mine to her line. And Linda came down the stairs while her SA was talking us through her range. She was so friendly and welcoming. Her SA was lovely too. Her place is truly a pleasure to visit. So unpretentious, very personal and inviting, and the people who work there are obviously pasisonate about her scents and genuinely enjoy talking about them. Sorry – that was a long response…….anyway, Ormonde Woman will be my unexpected summer experiment……. of course, i meant it’s fascinating that Linda describes OJ Woman as being a SUMMER scent……..!!!! I would have to agree…I certainly never thought of it as a summer scent at all! Actually, as much as I complain about flankers, an Ormonde Eau d’Ete would be kind of a nice thing! Thank you M! I actually like aldehydes in fragrance, or at least they have their place, but I love the clarity of the OJs. They are just fun to smell, even the ones that don't suit me personally. Ooooh, please tell Santa I've been very, very good! Let me know what you think of Champaca if you get a sample. K, that is too funny! Isn't she nice? It is true that she doesn't have a patchouli. Annieytown & I are also hoping she will do a real incense fragrance. I can't wait to hear what you think of the OJs. Wonderful review. Linda has been a friend of mine for ages now and I a sure that she will love the review too. My favourite is the original Ormonde. What a coincidence — I'm wearing it today too. It's this weather in the 50s — all this springtime. I had to put on something green. Curiously, the potency of the rice note seems to have faded in my bottle over the past year. Too bad: It was my favorite part. Thank you Prince Barry! I hope to review both of the Ormondes later this week. T, that is interesting, I thought the end of my Osmanthus bottle smelled different too…deeper, and more smoky. Still wonderful, but different. I think OJ steeps these for some time before selling, and perhaps they continue to change as they age? Another great OJ post, NST! You are simply a treasure, my dahling, a treasure. I think her scents have a depth and richness that is completely unique in the perf world and I look forward to the new iris scent she is supposedly coming up with this spring/summer. Thank you L! And Iris — that is wonderful news. 2nd this! An iris scent would be lovely! Thanks Robin for this lovely review of Champaca. I finished up my bottle and I miss it desperately. It is just the perfect springtime and summer fragrance. Hello Annie. There is nothing so sad as the last spray from the bottle, is there? Hope you're feeling better! Just got my bottle of this – cost an absolute fortune to get it here, but it was well worth it. It is just what I've been looking for, though strangely not what I expected. The green tea and rice combo had me expecting a kind of dry and astringent Genmaicha scent, but instead I got the creaminess that you mention. On me, I have to say that it doesn't smell much like rice cooking at all, but it has a slightly sweet richness that gives it foodie appeal. There is a faint incense-like quality, and a green tang, but neither overwhelms. Overall, it does come off dry, but with an almost biscuity depth. I like it a lot. Thanks, R! E, I am so glad you liked it — did you order it unsniffed? That is brave, because they are expensive! And did you get samples of any of the other OJs? I didn't get any samples, no, which was truly foolish, since I'm very impressed with the Champaca. Well, congrats on an unsniffed success…my unsniffed purchases so rarely work out! Highly recommend that you get samples of the rest if you can, it is such a wonderful line. Haven't smelled the Feu d'Issey! I might be completely bonkers, but I might have discovered a smell-a-like for OJ Champaca – Givenchy Very Irresistible Summer Cocktail (2008). It's rosier, but has that same creamy, slightly green/minty drydown going on. It's not an identical twin, but perhaps a close cousin. Anywhoo, figured I'd share so that next time you hit to Sephora you have something new to try! Wow, I'll see if I can find that — worth a shot! Thanks. Now, this I found to be a sleeper hit! It underwhelmed me at first – nice, wearable. But I tried it again on xmas day and grew to appreciate its understated, subtle, homely way of being. It was the perfect scent to wear during the long family lunch. The floral aspect is pretty, and then the tea and basmati enrich and elevate it to a whole other realm. Lovely. I can see why it is one of your favourites, Robin. Hmmmm – funny. I keep thinking about Champaca lately. I tried it a while ago, and enjoyed it, but not enough to buy a bottle. Suddenly, while searching for a wearable day-time scent, I find myself craving a bottle of this. It’s always a sign when you sample a perfume, then months down the line find yourself fantasising about it. I think I may have found my new daytime scent. Although, I just ordered a load of samplers from Andy Tauer and Frederic Malle, so I should probably hold-off until they arrive………!!!!!!!!!! agree it’s a sign, I could not stop sniffing it on my hand for two entire days. wnet straigh back to the counter and bought a bottle. New favorite daytime scent. Is it just me who thinks that Champaca is a dead ringer for Lancome Miracle? It’s been years since I smelled the latter so I’m sure there are plenty of subtle differences between the two but my instant reaction when trying Champaca for the first time was “Hang on, this smells just like Miracle”. I might pass by a department store and compare the two side by side. I was impressed with Champaca’s staying power, I could smell it on my sweater days after spraying. And I loved catching the occasional whiff of tea while wearing it, there was something quite comforting about that. Wow — have never tried them together, but Champaca didn’t call up Miracle to me. Maybe I missed something — do report back if you try them together! well hello there, post from eight years ago! I, too, smelled something instantly familiar when I sprayed Champaca on my rist (I’ve been telling the entire internet that I have recently received my OJ sample set). I’m glad the commenter mentionned miracle, as this does seem very similar! Not identical, but close enough to make me think I’d definitely smelled it somewhere! I do think I prefer it to miracle, though–it has a minty freshness combined with a creaminess that Miracle simply doesn’t have. Miracle, although I do love it, has a bit of a sharper edge that refuses to fade. Oh god, at least two out of the four samples i’ve tried so far feel fb-worthy to me!